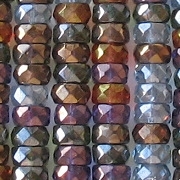 3mm (long) x 6mm (wide) rondelles with a square edge and facets around the outside. A rondelle is any round bead which is wider than it is long. The hole runs through the 3mm length. 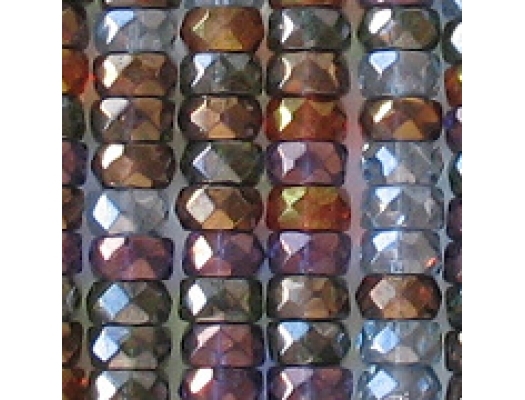 A mixture of translucent colors: light blue, mossy green, siam red, amethyst purple, and brown. 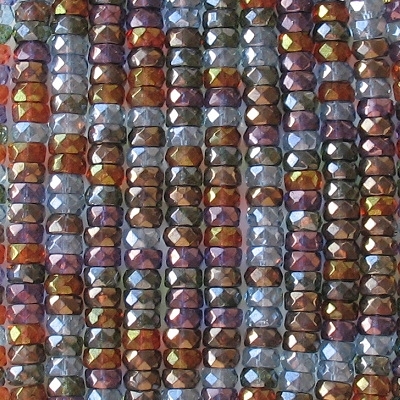 The light blue beads have a luster coating, and the others have a gold-luster or bronze-luster coating. Some beads (though I'm not sure which ones) may have the color in the coating and not in the glass. I like mixes like these. The Czech mixes come in various shades, and this mix is on the dark side.